We looked at the top 1 Litter Boxes and dug through the reviews from 4 of the most popular review sites including BestReviews, Best Reviews Guide, Kitty Loaf, Pet Smart Blog and more. Through this analysis, we've determined the best Litter Box you should buy. In our analysis of 48 expert reviews, the Nature's Miracle Nature's Miracle Advanced Corner Hooded Cat Litter Box placed 6th when we looked at the top 12 products in the category. For the full ranking, see below. 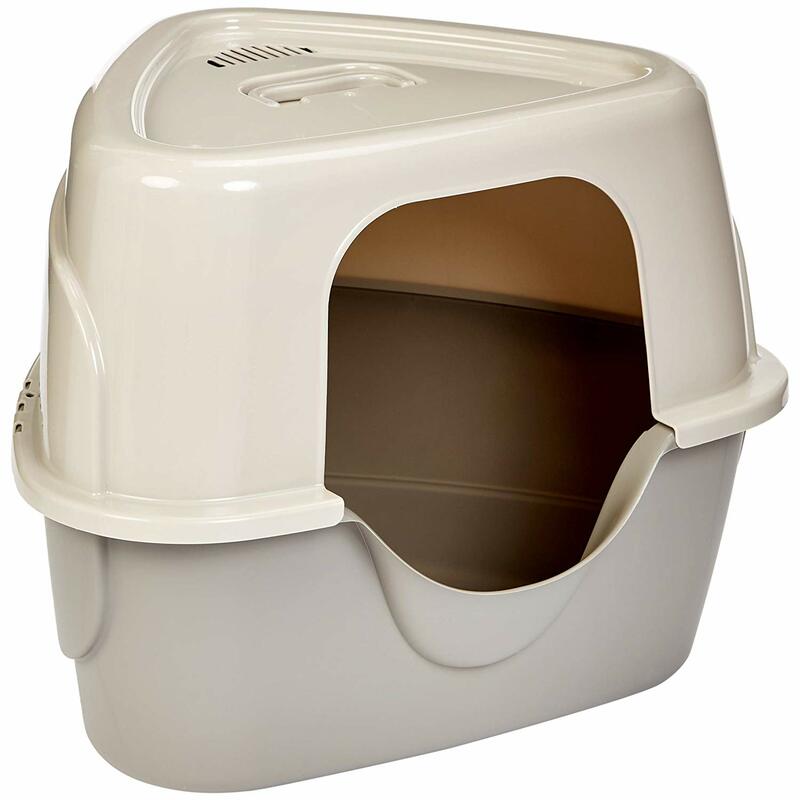 Checkout The Best Litter Box for a detailed review of all the top litter boxes. space saving corner design. non-stick surface is easy to clean. 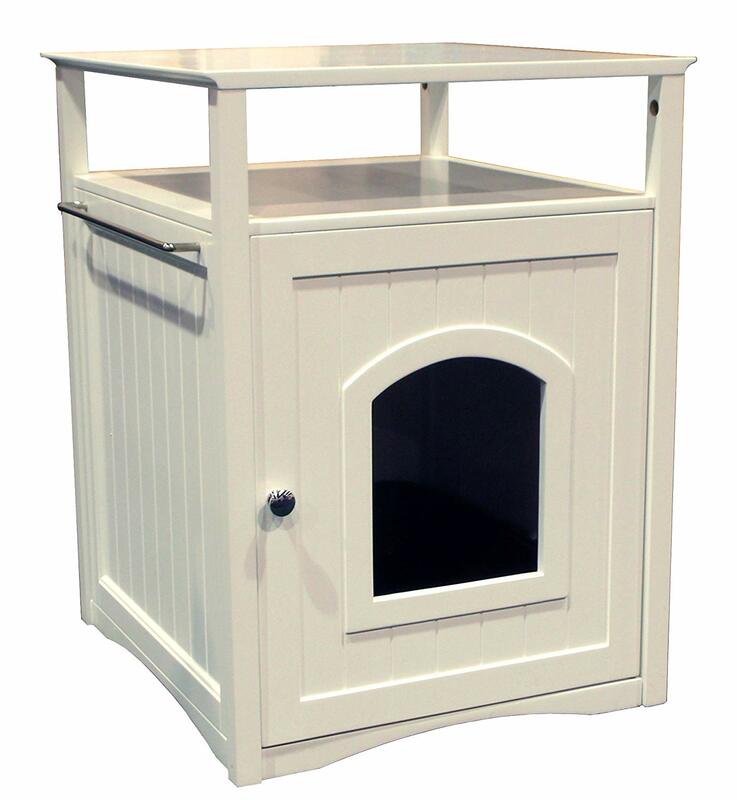 The corner design makes the litter box easier to hide away and makes sure that it does not take away from the style of your home, once again making it look more presentable for guests and family. the opening is somewhat small and not ideal for larger cats. Nature's Miracle® Plastic Technology Odor Blocking:Guards against odors caused by bacteria, Prevents odors from being absorbed into plastic. Antimicrobial Product Protection:Inhibits odors caused by bacteria on the litter box Non-Stick Surface: Eliminates litter caking and odor buildup, Makes clean up easy! There’s nothing like snuggling up with your favorite feline after a long day. Cats are one of the most popular pets in the country. More than 36 million households have a feisty kitty in residence. Cats have a reputation for being harder to win over than dogs, but if you learn how to read them, they’ll be crawling into your lap in no time. Cats are very sensitive to their environments. Moves, new roommates or even a new piece of furniture can stress them out. One of the most important parts of your cat’s environment is the one thing we’d like to hide away: the litter box. Choosing the right litter box is essential for your cat’s health. Cats that are comfortable in their litter boxes are less likely to have accidents outside of the box. Plenty of people grab the cheapest litter box at the pet store and call it a day, but there’s more to consider if you want a happy home for your feline. First off, your cat’s litter box needs to be easy to get into. 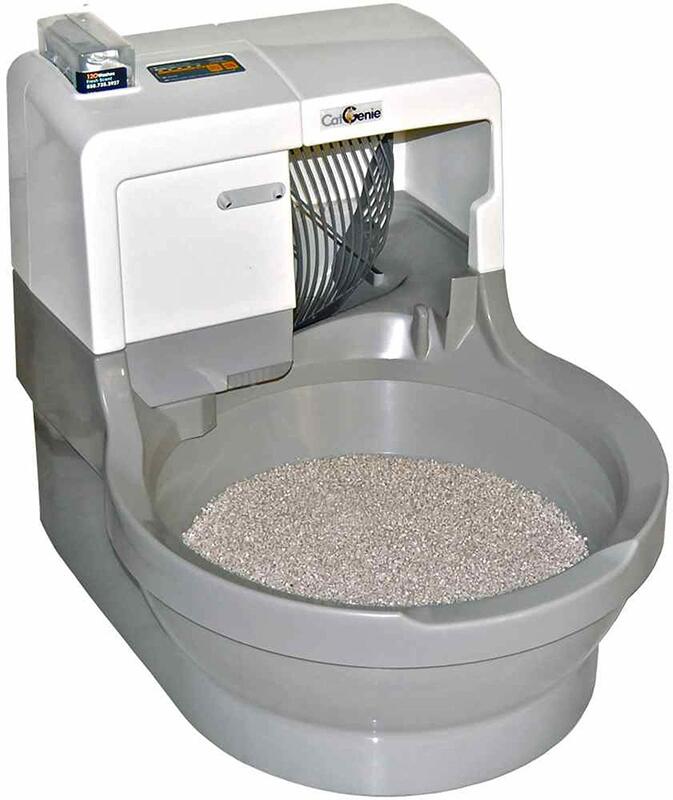 This might seem like a no-brainer, but different kitties have different priorities when it comes to litter box entry. Most cats are fine with an open-top box, like Petmate’s Open Litter Pan. However, older cats might need a little help getting in and out. Nature’s Miracle High-Sided Litter Box dips down at the entrance, so your cat can stroll inside instead of hopping into the box. 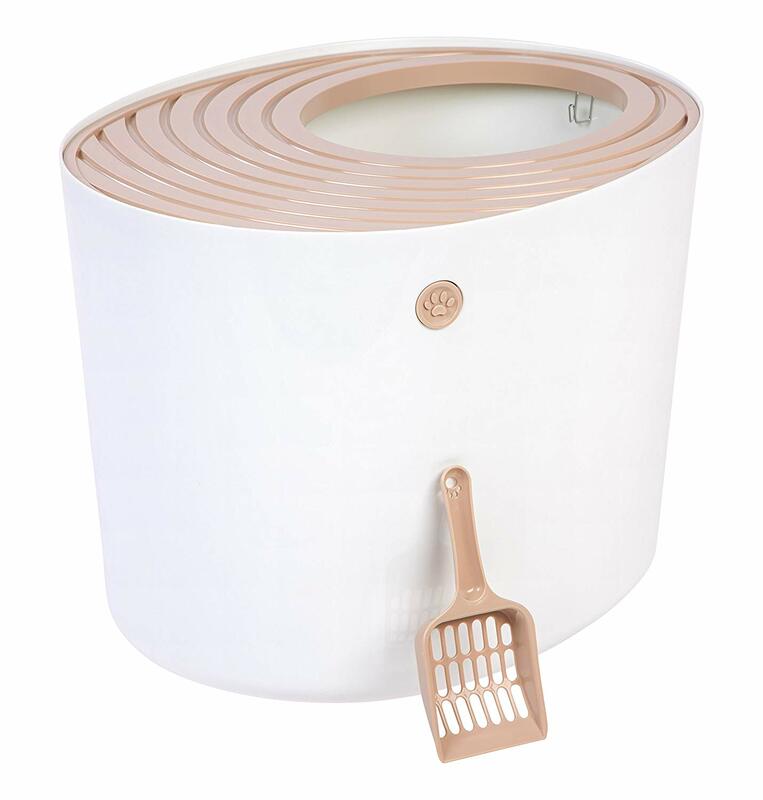 Other cats do well with a hooded litter box, like Catit’s Jumbo Hooded Litter Pan. Hooded boxes reduce the amount of litter that your cat kicks out when they’ve finished their business, and Catit’s pan also has a clear door for even more litter tracking control. 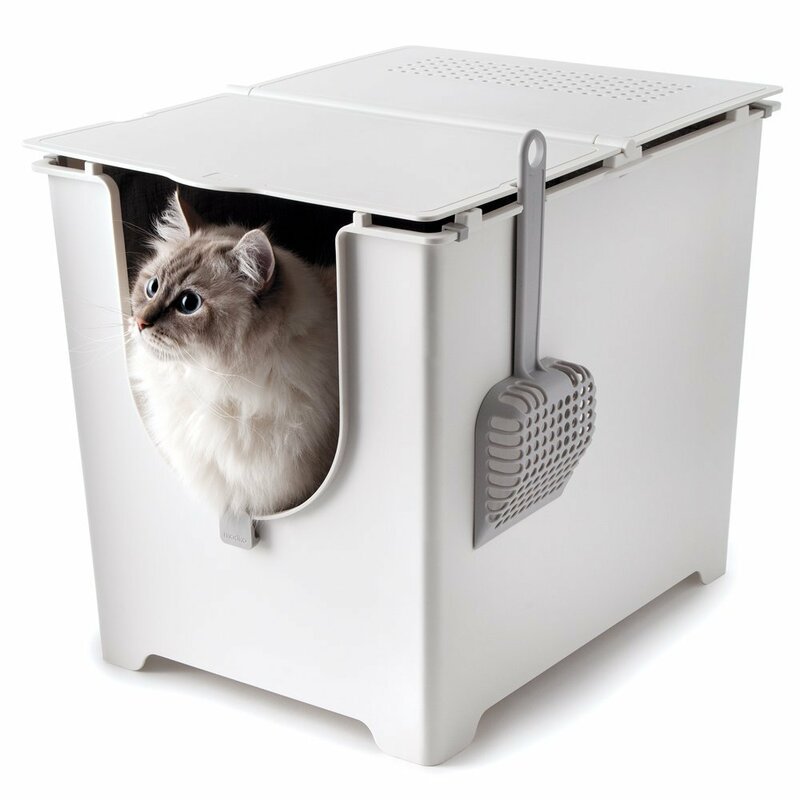 If your cat likes hooded pans but balks at using a box with a door, Purina’s Tidy Cats BREEZE Litter Box System might be a better choice. Picking the right pan for your cat is important, but your cat can’t comfortably use it if you don’t buy the right size. You wouldn’t want to use a bathroom with your knees shoved against the door when you sit down, and neither does your cat. Cats need to be able to turn all the way around in their box so they have enough room to bury their business. The perfect litter box is at least one-and-a-half-times the length of your cat. 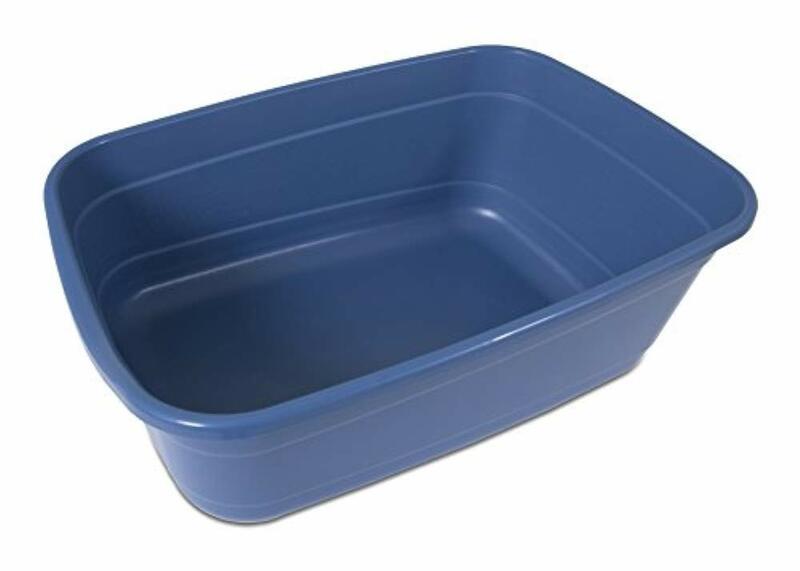 Catit’s Jumbo Litter Pan is an impressive 22.4 in L x 20 in W, leaving plenty of room for full-figured felines. Mid-sized cats or kittens can get away with the slightly smaller dimensions of Petmate’s Open Litter Pan. Maintaining a pristine litter box is crucial for a healthy kitty. You should scoop the box at least once a day (more if you have multiple cats using the same box). Every few weeks, you should also dump out all the old litter, disinfect the box and refill it with fresh litter. However, certain litter boxes are easier to scoop out than others. Open pans, like Nature’s Miracle High-Sided Litter Box, are a snap to scoop. Hooded pans take a little more maneuvering, but the Catit Jumbo Pan’s hood lifts up for simpler scooping. Purina’s BREEZE Box absorbs urine with disposable pads, so you might not have to scoop out clumps of urine as frequently. Many first-time cat owners hide the litter box away in a basement, utility room, garage or another room where people don’t usually hang out. They usually do it because they want to keep the box’s smell or appearance away from visitors. However, placing your litter box in an unpleasant environment discourages your cat from using it. Keep the box in a warm, friendly spot that’s easily accessible for your cat. If you really want to hide the inside of the box, a hooded box like Catit’s Jumbo Litter Pan can keep your litter under wraps. Scooping litter is a reality you’ll have to face as a cat owner. Self-scooping litter boxes exist, but the noises they make are a turnoff for some kitties. There are plenty of other options that make life easier without the mechanical sounds of an automatic scooper. For example, Purina Tidy Cats BREEZE Litter Box System uses a combination of disposable urine pads and anti-tracking, clumping litter pellets to keep your cat’s box a little cleaner. A dream litter box would scoop itself, never smell, turn invisible when guests come over and be comfortable for your cat. That magic box doesn’t exist, but you can get pretty close if you follow our tips and advice below. If you’re patting yourself on the back for bringing out friendly behavior in normally aloof felines, you might want to hold off on the accolades. A comprehensive study of domesticated cat DNA showed that the genes in today’s house cats are virtually the same as the genes from wildcats that lived thousands of years ago. Dog DNA underwent major makeovers after humans domesticated them. So what gives? It turns out that cats DNA hasn’t changed because we didn’t domesticate them — they domesticated themselves. Humans are great at creating waste, and mice love waste. Cats cozied up to human settlements to get to the mice, and they eventually decided that we were worthy of their time, too. That doesn’t mean that your tabby is just in it for the mice, though. Cats and humans form strong bonds every day (but it doesn’t hurt that you’ve got your hand on their treat bag). How many cats do you have? If you’re a single-cat household, you’ll only need to buy one box that’s sized for your cat. Multi-cat households might need more than one litter box, and you’ll want all of the boxes to be larger so your cat can avoid stepping in another kitty’s mess. You’ll also need to scoop your boxes more frequently, so make sure you buy easy-access open pans or a hooded pan with a flip lid like Catit’s Jumbo Litter Pan. 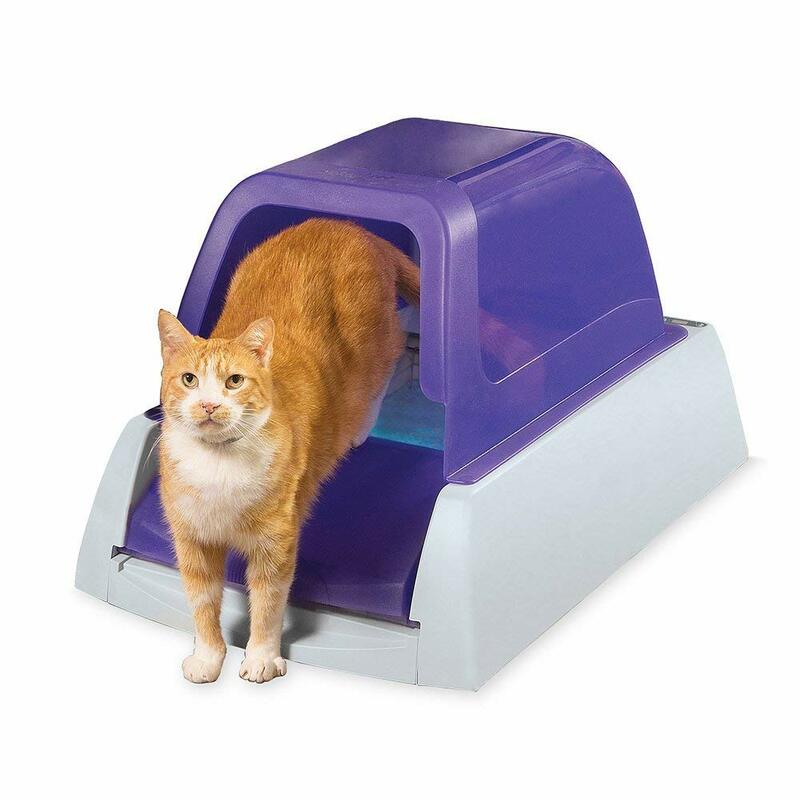 Buying a box that’s large enough for your feline friend to comfortably turn around in encourages them to keep their business inside the litter pan. Use a measuring tape to measure your cat from nose to bottom. Then, find a box that’s one-and-a-half times longer than that number. Is your cat a litter kicker? Unfortunately, you won’t find this out until after you buy your first litter box. If your furry friend kicks up a lot of litter when they’re using their box, you’ll want to pick a box with high sides, like Nature’s Miracle High-Sided Litter Box. Most cats track some litter onto the floor after they leave their box. Some litters don’t track as much out of the box as others. The Purina Tidy Cats BREEZE Litter System comes with a bag of anti-tracking pellets to keep litter in the box and off your floor. The litter you keep in your box is just as important as the box itself. Clumping clay litter is the most common choice, but it’s far from the only option. Other types of litter include non-clumping clay litter, silica gel crystals, recycled paper, pine, corn, wheat, walnut shells and new grass litter. Every cat is different, so if they’re eliminating outside of their box it might be worth it to try a new litter. If you want to change your cat’s brand of litter or switch to a new formula, don’t do it all at once. An abrupt change might be a turn-off for your pet. Start mixing small amounts of the new litter in with the old litter, then gradually reverse that ratio over the course of a few weeks until you’re using the entirely new litter. Your cat’s litter box can tell you a lot about their health. If you notice your kitty using the box much more or much less than usual or the appearance of their business has changed, talk to your veterinarian. Cats who always stick to their box and suddenly start eliminating in inappropriate locations might also have a health issue that needs examining.